While wireless and mobile topics have been central to any discussion regarding IT strategy for some time, an element that goes hand-in-hand with mobility is the provisioning of a broad range of services in the cloud. Cloud, for our purposes here, refers to any capability that is made available via a network connection, this so as to encompass both public (typically, Web-based) as well as local or private cloud services. The concept of cloud services, often referred to as Software as a Service, or SaaS, is of course very much in keeping with that other key contemporary trend in IT, virtualization (in this context, of services) which today forms the cornerstone of numerous IT strategies. But one of the most interesting possibilities in cloud-based services today is to offload or even outsource capabilities that would otherwise need to be provisioned and managed locally - in other words, converting the capital expense (CapEx) involved in implementing a needed IT service into an operating expense (OpEx) - the opposite of the advice we normally offer with respect to overall IT financial strategy. 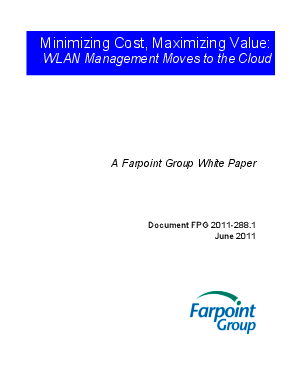 But, as we'll explore in the Farpoint Group White Paper, the flexibility inherent in provisioning the service in question here, WLAN management, in the cloud, along with the potential for bottom-line cost savings, is enormous. These two factors - flexibility and economics - after all, drive today's steadily-increasing interest in the cloud for everything in IT, from processing to storage to Web-based publishing and interaction to - wireless LAN management.